Evergreen Bespoke Landscaping and Driveways ​​ have the experience and qualifications to provide our customers with a full range of landscaping services. Whilst we are Artificial Grass and Decking specialists our services include everything from indian stone paving to sleeper walls. We can even design your garden using our 3D cad programme. Scrolling down this page will show you all the landscaping services we provide In Staffordshire and Cheshire. 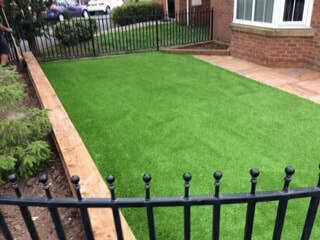 Artificial Grass is a great option for our customers who which to have a green lush lawn 365 days a year. Decking is very popular for people who wish to have a statement peice added to there garden. Evergreen Bespoke Landscaping and Driveways ​​ install both composite and natural wooden decking throughout Stoke-on-Trent, Staffordshire and Cheshire. Which ever type of decking you decide upon our professional staff will ensure you have the perfect place to entertain and relax in your garden. When it comes to have a fence installed there are various options to consider. These days there are many types of fencing to choose from. Evergreen Bespoke Landscaping and Driveways ​​provide you with not just the quality of staff to ensure your new fence will remain for years to come but also with the skill to advise you on the choices that will suit both the style of your garden and also the right fence to suit your needs. Below are a few examples of the fencing types and styles we provide. For a detailed quote call us today. Gravel is a great way to add colour, ease of maintenance and a clean look to any garden. the utility product of choice for any experienced landscaper due to it being able to be used in so many ways. To cover planted areas with a membrane to prevent weeds, to provide an excellent parking space or even to add drainage to boggy areas are just a few that come to mind when thinking of gravel. Gravel should always be looked at to provide you with an option to help create the garden you are looking for. When it comes to a new driveway there are various options to choose from. Block paving? Tarmac? Resin Bond? Evergreen Bespoke Landscaping and Driveways ​​ will provide you with the professional craftsmanship to ensure you have the new driveway that you always wanted.